Made in 1991 by Félix Gonzáles-Torres, Untitled (Perfect Lovers) uses two identical, shop bought clocks. 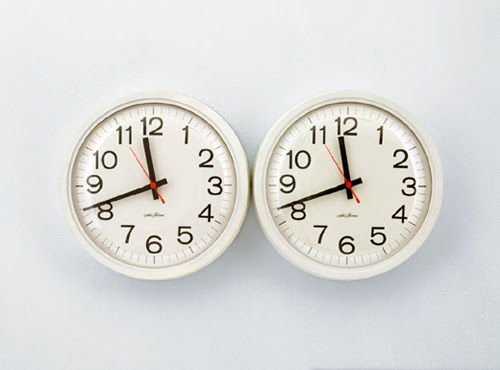 Displayed adjacent to, and barely touching one another, the two battery-powered clocks were initially set to the same time, but as time passes they inevitably fall further and further out of sync with each one another. As a beautiful and simple allegory of love and partnership, Gonzáles-Torres pairs together two ubiquitous objects which are ultimately destined to disrupt their perfect harmony. He is known for combining the impulses of Conceptual art, Minimalism and political activism. During his life time he repeatedly commented that his primary audience was his lover, Ross Laycock who died from AIDS 6 years before his own death from the disease in 1996. Bringing an autobiographical sadness to the work, ideas of mortality are introduced to his allegory of love and synchronicity.